The Telangana state government announced its new solar power policy this week, with many incentives for solar power developers. The policy, valid for the next five years, aims at "creating an enabling environment for prospective solar power developers to harness substantial quantum of solar power in the best possible manner". “Telangana Solar Power Policy 2015” will be applicable to grid-connected solar power projects based on both photovoltaic (PV) as well as solar thermal technologies. These projects will supply power to state distribution companies and sell it to third parties within the state. The policy proposes a flurry of sops for developers. The incentives include a single-window and speedy clearance to all solar projects, exemption from the Land Ceiling Act, deemed conversion to non-agricultural land status for the land acquired for the project, 100 per cent refund on value-added tax (VAT) and goods and services tax (GST), refund on stamp duty, exemption from electricity wheeling charges and consent from the state pollution control board within seven days. All solar projects that are commissioned during the operative period of the policy will be eligible for the incentives for a period of ten years from the date of commissioning. To avail of the benefits under this policy, the power generated has to be consumed within the state. "Telangana has vast solar potential with average solar insolation of nearly 5.5 kWh/m2 for more 300 sunshine days. Government of Telangana intends to make use of the positive environment in solar market and push given by Government of India for substantially harnessing the solar potential in the state of Telangana," says the policy. A solar policy cell (SPC) will be set up for policy implementation. SPC will undertake single-window clearance for all the projects. A transaction charge of Rs 10,000/MW shall be charged for processing through single-window clearance with a maximum of Rs 2 lakh per project. The modalities of the single-window clearance mechanism will be notified within 30 days. A solar park is a concentrated zone of development of solar power projects, which provides developers an area with good infrastructure facilities. The policy proposes to form a solar park implementing agency by the state government with partial private sector participation or independently by the private sector. Solar parks will host an array of players in the solar power sector, including solar power plants, component manufacturers, research and development centres, training centres, and financial institutions. "The state will extend all facilities and fiscal incentives provided by the Central government or National Solar Mission to the manufacturers and others in solar parks," says the policy. 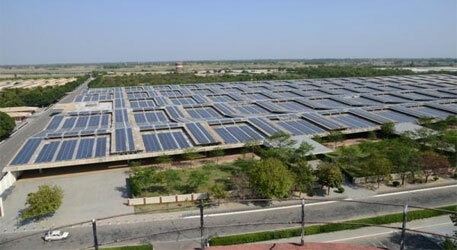 It will be the responsibility of the project developer to acquire land for the solar project. Even agricultural land can be acquired for this purpose, says the policy. Land acquired for any solar project or for solar park will be deemed to be converted to non-agricultural land status on payment of applicable conversion charges to the SPC and no further conversion procedures will need to be followed by the developers regarding the acquired land. The conversion charges would be as per the Agricultural Land (Conversion for Non-agricultural Purposes) Act, 2006. For land acquisition for solar projects and solar parks, the ceiling limit under the Land Ceiling Act will not be applicable. However, the land requirement will be decided at the rate of 2 hectares/MW or any lower limit based on the advancement of technology. Rooftop solar power producers (consumers) are free to choose either the net or gross metering option for sale of power to the state power distribution companies (discoms), for 25 years, with tariff variations between the two. Applications for rooftop projects or open access clearances will be processed by the respective discoms within 21 days from the date of application, or else, they will be deemed to have been approved. The policy also proposes a gradual conversion from conventional pump sets to solar-powered pump sets through subsidy support. The state government, in collaboration with the Central government and other agencies, will undertake measures to enable this. The scheme of gross metering facility would be extended to project developers and farmers for setting up solar pump sets. All the projects will be awarded “must-run” status, which is to say that power thereof must be purchased by discoms as and when produced. Producers can bank energy, and use at a later date, except during peak months and hours. The unutilised banked energy will be considered as deemed to be purchased by discoms. A seven-member high level committee will be constituted for monitoring the progress of the projects, with state energy secretary, senior representatives of state power distribution companies and Non and Renewable Energy Development Corporation, besides two representatives from industry bodies (rotating), and two representatives of solar power developers.